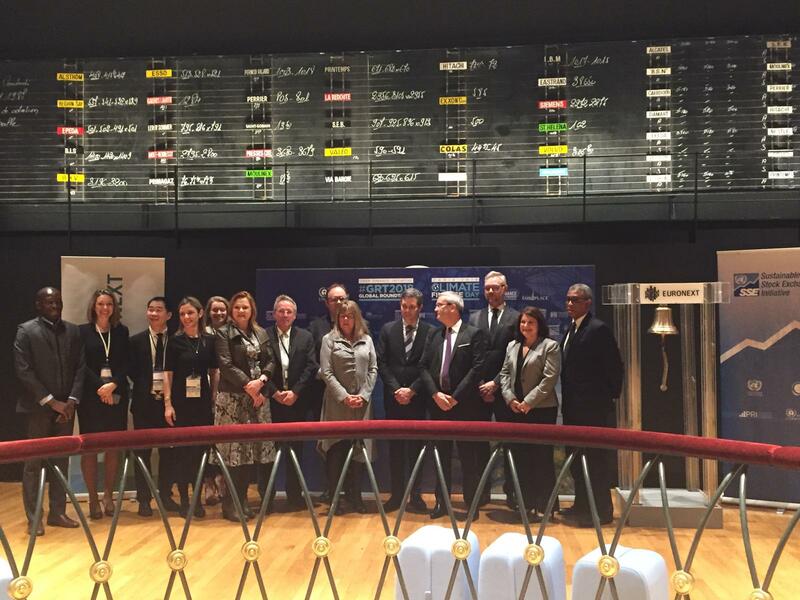 Euronext opened financial markets in Paris on 27 November 2018 at Palais Brongniart in support of the Climate Finance Week in Paris dedicated to delivering a sustainable financial system with the UNEP FI Global Roundtable and the 4th Climate Finance Day. The event included participation from Eric Forest, Head of Listing France for Euronext, Philippe Zaouati, Chair of Finance for Tomorrow and CEO of Mirova, Martin Skancke, Chair of the PRI, Eric Usher, Head of UNEP FI, and Satya Tripathi, Assistant Secretary-General and Head of the New York Office of the United Nations Environment. Euronext Group joined the Sustainable Stock Exchanges initiative in 2015 with the objective to further support the implementation of the Paris Climate Agreement, the Sustainable Development Goals, and to enhance corporate transparency in France and throughout European markets. Learn more about the Sustainable Stock Exchanges initiative here.